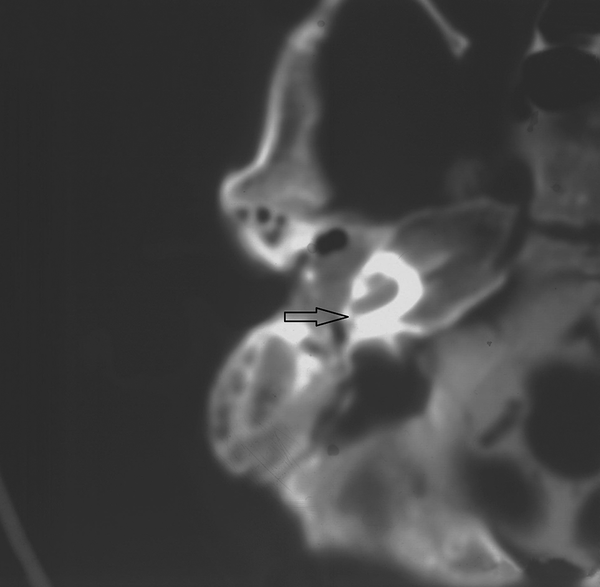 To Cite: Alizadeh H, Nasri F, Mehdizadeh M, Jamsa S. Computed Tomography Findings of a Patient with Severe Dysplasia of the Inner Ear and Recurrent Meningitis: A Case Report of Gusher Ear in a Five-Year Old Boy, Iran J Radiol. 2014 ; 11(3):e4168. doi: 10.5812/iranjradiol.4168. Communication between subarachnoid and per lymphatic spaces can be due to a deficiency of lamina crib Rosa (stapes gusher). Recognition of the condition may alter the course of treatment that can avoid perilymph gushing. A five-year-old boy presented with a history of congenital hearing loss and recurrent meningitis. 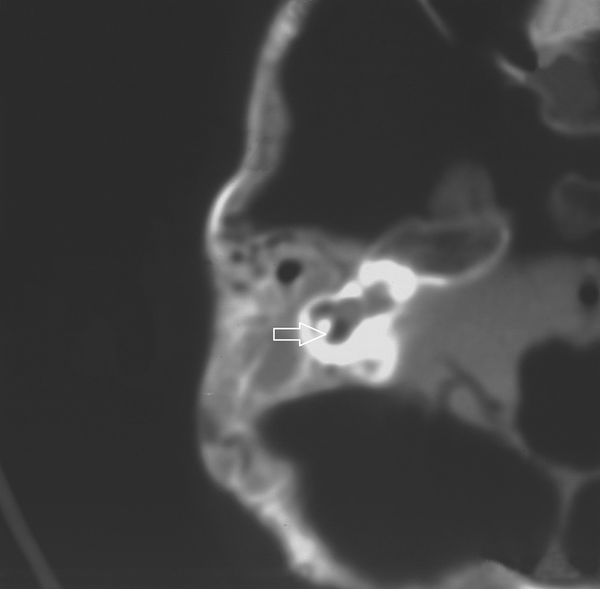 The computed tomography (CT) of the temporal bone showed severe bilateral dysplasia in the inner ears in favor of gusher disease. Gusher phenomenon is a dramatic complication of stapes surgery that consists in sudden exists of per lymphatic fluid during the course of the surgery. A congenital malformation that causes abnormal communication between the per lymphatic space and the subarachnoid space is considered as the etiology. It can present with otorrhea or rhinorrhea; sometimes associated with recurrent meningitis, but in most cases it remains undetected for several years. We present the imaging finding of a five-year-old boy with a history of congenital hearing loss and recurrent meningitis. A five-year-old boy presented with bilateral deafness and recurrent meningitis. The patient had six episodes of meningitis proven with LP and CSF analysis. Physical examination revealed bilateral negative Rinne test using a 512-HZ tuning fork. No response was identified on evoked response audiometry (ERA) at 100 db. 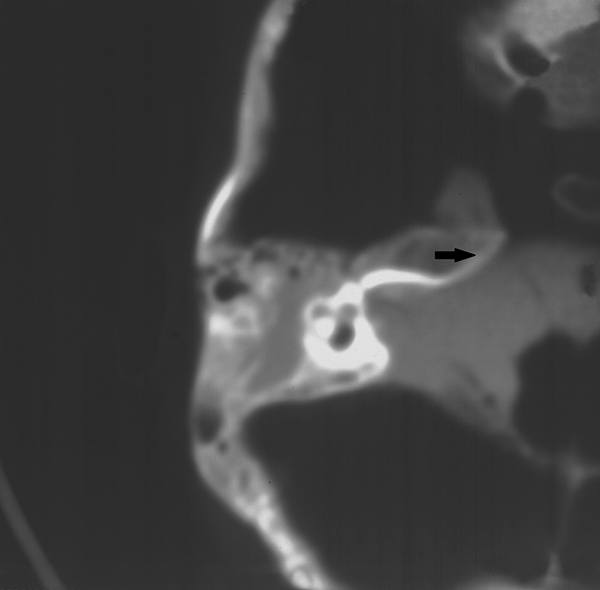 High resolution computed tomography of the temporal bones was obtained after the injection of contrast media in the thecal sac using 1mm axial sections. Scan was performed with a 16 slice MDCT, GE machine. Seven millilitres of visipaque 300mg/ml was injected intrathecally through lumbar puncture and the patient was positioned to fill basal cisterns. This study showed serious structural congenital abnormalities including dysplasia of the cochlea, widening of the cochlear base at the entrance of the cochlear nerve, absence of the modiolus and dysplastic vestibule associated with dysplastic lateral and superior semicircular canal (Figure 1 and 2). 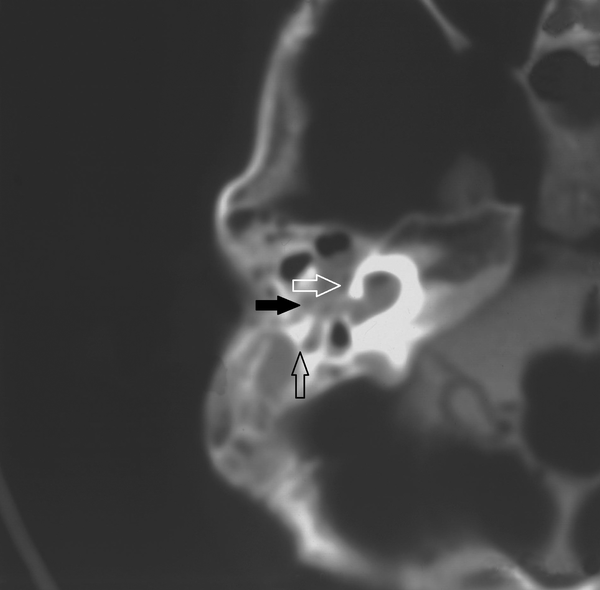 Bilateral ballooning of the internal auditory channels (IACs) was also depicted in the presence of contrast media in the tympanic cavity and it showed a remarkable entry of contrast media in the nasopharynx that confirmed the communication of perilymphatic space with cerebrospinal fluid (CSF) in the subarachnoid space and tympanic cavity (Figure 3 and 4). The first and the largest case series describing CT features of stapes gusher (X-linked mixed hearing loss) was published by Phelps et al. (1). They found that 16 out of 24 affected male patients had bulbous IACs and incomplete separations of the basal turn of the cochlea from the fundi of the IAC. They also demonstrated enlarged first and second parts of the intra temporal facial nerve canals. Later on, Talbot and Wilson (2) described four patients with X-linked deafness. In addition to the typical findings described above, they observed the absence of bony modioli and abnormal vestibular aqueducts in all patients. Tang and Parnes (3) described two patients with widening of the IAC fundi and an absent bony plate between them and the basal turn of the cochlea. More than 3 mm widening of the cochlear nerve canal and absence of the modioli are two necessary and sufficient factors for the diagnosis of gusher disease (4). Papadaki et al. found that X-linked deafness with stapes gusher is related to communication between the subarachnoid and perilymphatic spaces, probably due to a deficiency or absence of the bony plate (lamina cribrosa). The role of the bony plate is to separate the lateral end of the IAC from the basal turn of the cochlea (5). This communication causes increased perilymphatic pressure and stapes footplate fixation with conductive hearing impairment. Even mild manipulation of the stapes throughout surgery can contribute to a stapes gusher in these patients. The augmented perilymphatic pressure causes progressive cochlear nerve dysfunction and leads to progressive sensorineural hearing loss. The overall mixed progressive hearing loss with perilymphatic gusher are consequences of stapes surgery (3, 5). In our case, presence of contrast media in the right cerebellopontine angle, internal auditory canal, and tympanic cavity after lumbar injection shows a communication between subarachnoid and perilymphatic spaces, explaining the patient’s recurrent meningitis. Moreover, in our patient, dysplasia of both inner structures such as the cochlea, vestibule, lateral and superior semicircular canals and absence of the posterior semicircular canal suggest that the patient has a severe mixed dysplasia of the inner ear. It also reminds us of the relationship between mondini deformity and gusher ear. The most serious problem about this patient is recurrent meningitis due to abnormal communication of the inner ear to the meningeal space. In comparison with other studies, in this case, the main chief complaint of the patient was recurrent meningitis and bilateral deafness together or the progressive hearing loss solely. If the patients were not presented with meningitis and they got any surgery on the middle ear and foot plate of the stapes on the oval window, the surgeon would figure out an abnormal jet of CSF from the inner ear into the tympanic cavity. The patient went under surgery for occlusion of the site of the leakage and fortunately more than a year after surgery, we have not observed any recurrence of meningitis. The management of this problem is surgical insertion of a patch at the depth of IAC or the opening of the cochlea to IAC. In conclusion, knowing about the described subject is very important for a radiologist because not diagnosing the syndrome can cause serious problems for the patient. We would like to thank the department of radiology, Medical Children Center Hospital, Tehran University of Medical Sciences. Implication for health policy/practice/research/medical education: Gusher phenomenon is a dramatic complication of stapedectomy that consists in sudden exist of per lymphatic fluid during the course of surgery. So knowing about this phenomenon is very important for radiologist because misdiagnosis can cause serious problems and catastrophic consequences for the patients. Financial Disclosure: The authors have no financial interest related to the present study. Funding/Support: This work was supported by Medical Children Center Hospital, Tehran University of Medical Sciences, Tehran, Iran. The role of the sponsor was to provide the expense of the patient’s CT scan performance.